WTH happened to the map!? Discussion in 'Fable III' started by ThatRandomDude, Jan 15, 2011. What happened to the guild? If I am wrong on any of these statements, please post. Here's what I made that might answer your question. I bummed the original map from Lionhead forums and made it more purdy and easier to read. Mourningwood is connected to the Bowerstone Cemetery, hence the graveyards. No one would remotely try to bury their dead in Wraithmarsh unless they have a death wish. This can also explain why Mourningwood connects into Bowerstone's sewer system. The forests around Brightwall are smaller obviously because Brightwall is much closer to the mountains (forests tend to diminish due to cold climates). Wraithmarsh and Bloodstone are obviously untouched. (Reaver himself remarks on Bloodstone, indicating that it's still going strong). The guild has been long gone. However, it was found in Bower Lake in Fable 2, which is now renamed as Millfields in Fable 3. Hero Hill is located up on the right side of Reaver's Mansion apparently. I'd also like to point out that the map in TLC is fundamentally inaccurate due to the lack of using a sextant at the time. Like in real life, if you go back to see Europe or Asia in ancient maps it obviously looks very different from the standard one we have now because navigators had yet to discover a way to properly scale locations. The same goes for TLC's Albion---who might have not even discovered Aurora yet, hence why it's not on the map at the time it was drawn. Lastly, this map I believe is a bit inaccurate. Albion should tilt more to the left because in this map, Aurora is somewhere to the left, which is inaccurate in the map in the third game because it's the opposite way. "The town may have been formed by those who descended from the original survivors of the first destruction of Oakvale, or by Oakvale townspeople and Barrow Fields traders, who left their areas for various reasons, traveling, trading, or a change of scenery; this could also explain the town's name: Oak·field, a combination of Oakvale and Barrow Fields. Other survivors likely took refuge to Bloodstone, as it shared a border and had already been built before Oakvale's destruction." So, it's speculated that the last of Oakvale and Barrow Field's populace simply migrated up north and started an new town--well away from Wraithmarsh (I wouldn't want to be anywhere near there after what happened too). If you're thinking of Continental Drifting, that's impossible. It takes hundreds of millions of years for continents to drift and form new landmasses. To say that in the span of fifty to five hundred years that Albion changed through this concept is just silly. Cities and geological conditions may change dramatically (Oakvale---an idyllic village turned into the swampy Wraithmarsh), but the land doesn't change. Like I said before, Albion has just recently acquired the invention of the sextant which is used to figure out how far things are for charting up precise navigation maps. This would obviously show that the land is much bigger than what the citizens of Albion thought it'd be. 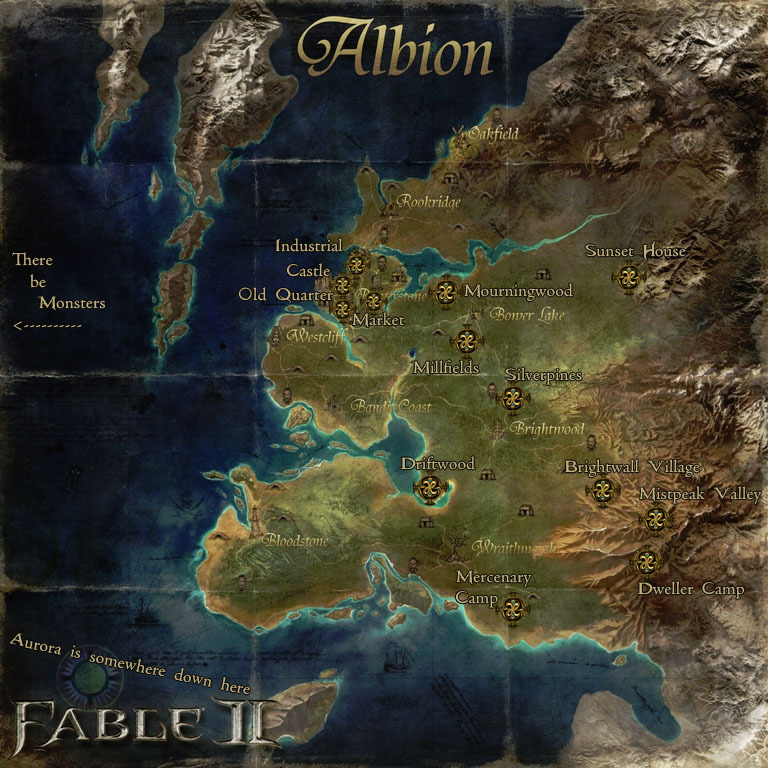 Therefore the TLC map is much more inaccurate than the world map shown in Fable 3. Noooooo, I stand by what Lydia said. It's because in the first Fable they weren't able to accurately create the maps. Since the invention of the sextant (and other instruments?) they were able to make them much better, like the ones you see in Fable 2 and 3. It's as simple as that. Wouldn't it be put in Fable 3 canon if it did happen? The only time we hear of a hero causing a shift in tectonic plating was William Black against the Queen of Blades, both of whom seemed to create mountains during their battle. But even then, that can be pure legend than fact. Sparrow and Garth were powerful, but not THAT powerful. This is going into a pure random speculation territory. It's canon that Albion used a sextant for future maps, simple as that. Sometimes the simplest reason is the best reason. Great map, Lydia. You did a brilliant job considering I still think the Fable 3 map makes little sense. Edit: Oh I see, someone else made it and you edited it. Good map anyway. haha. Wait no... ahh confusion. Brightwall has never been next to Bowerstone. And just because this is a game doesn't mean that the developers lazily waved canon bye-bye for kicks. It just takes a simple bit of brainpower just to know where everything goes. Why waste Lionhead's time when the answer is right there?